Ever since frequenting Quirino Highway in Quezon City, I’ve always passed by an old panciteria near the Sangandaan intersection. 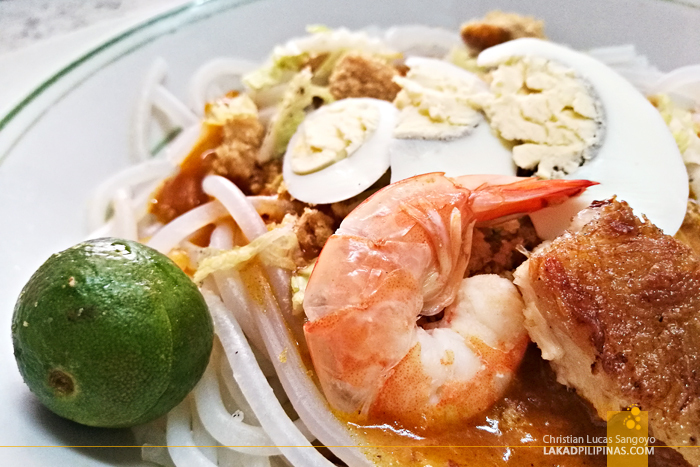 Aling Leoning’s Special Pancit Palabok, it humbly proclaimed above its doors. I’ve always thought of trying out their food, but I always gravitate to the nearby Jollibee and its mouthwatering Chickenjoy. About two weeks ago, together with A and C, I finally got the gumption to avoid the bee, enter the old panciteria, and try their noodles. 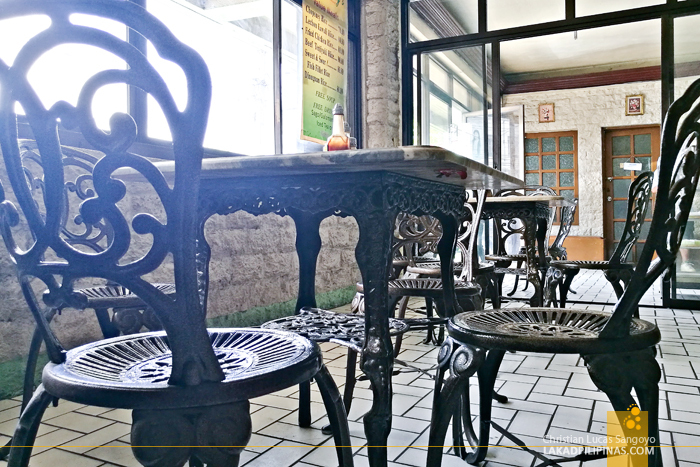 Aling Leoning’s naturally lighted interiors is straightforward enough. A foyer leads diners to a counter where they take your order, you then turn right to the small dining hall filled with a combination of heavy iron and rattan chairs paired with marble-topped tables. The furnishing was more fitting for a garden, than say, a panciteria, but I guess it gets the job done. As we waited for our orders, I noticed pictures of a kindly old woman posted on the center wall, Aling Leoning herself. 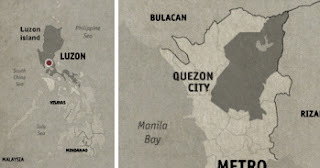 And along it, a caption telling visitors that they’ve been serving pancit luglog, palabok, and caldo since 1940. From its look, one would assume it’s old, but I never thought it went 77 years back! It’s interesting to know that the restaurant, while named after her, is actually started by her mother, Lola Juana. 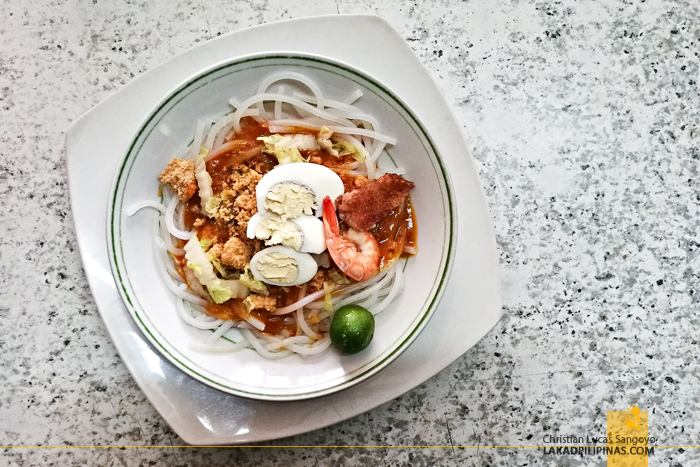 This is their main branch and it has since blossomed from a simple carinderia to three more branches in Quezon City—one in Project 8, another in Baesa, and lastly, at the Landmark Foodcourt in Trinoma! Browsing through their menu, I saw that they also serve pares, lugaw, tokwa’t baboy, okoy, puto at dinuguan, chop suey, silog meals, and a host of Filipino native desserts besides the usual panciteria fare. Prices were higher than your usual carinderia, with a meal costing about PHP80.00 per order. After minutes of waiting, our brunch arrived one after the other. It seems that they cook your food upon order; they were served about two to three minutes apart. The first one we tried was their house specialty, the pancit Malabon. 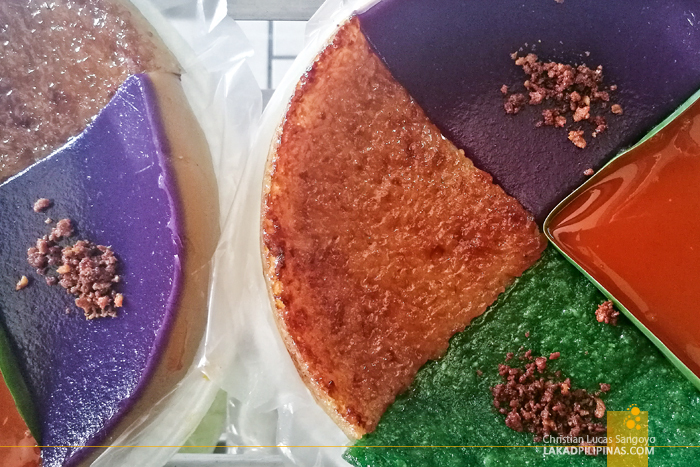 I grew up in Malabon and even then, I found it to be quite good. The flavor was very subtle, with the crushed chicharon, slice of pork, hardboiled egg, and shrimp adding that extra oomph. 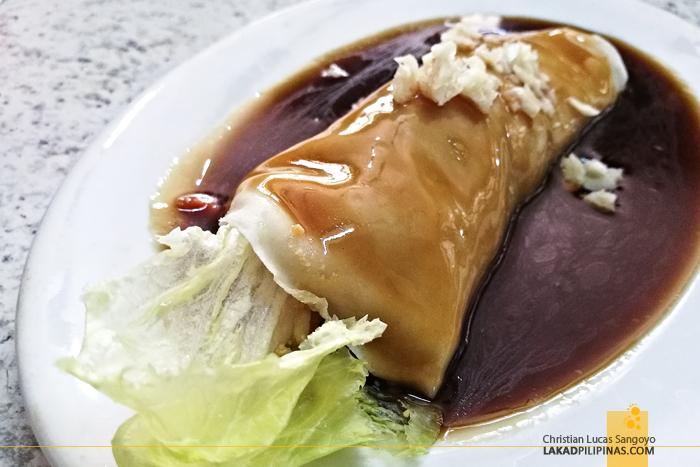 The fresh lumpiang ubod was next. The whole thing was swimming on dark sweet garlicky sauce. While it was much more flavorful than the pancit, I found its sauce to be a bit thin in consistency. It was still superb, nonetheless. And finally, my own order came—fried shrimp okoy. The first thing I noticed was that there’s only a single shrimp on it. 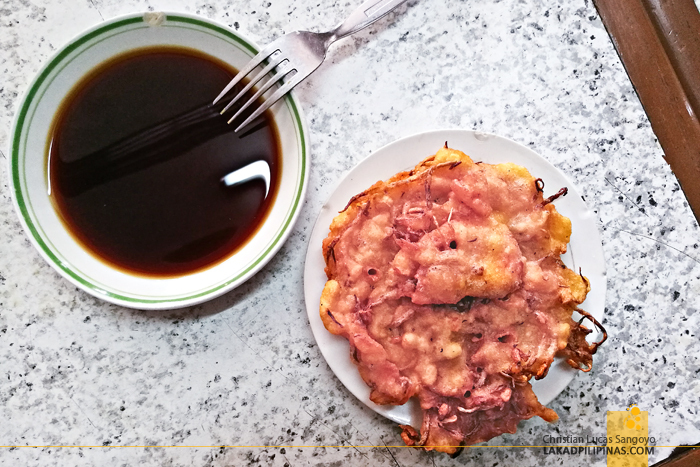 Okoy is one of my most favorite snack at Malabon’s public market and I’m used to having my okoy brimming with shrimp. For the price, it was a bit of a letdown, but taste-wise, it was okay enough—very crunchy with bits of softness inside. I also love the soy vinegar sauce that it came with. 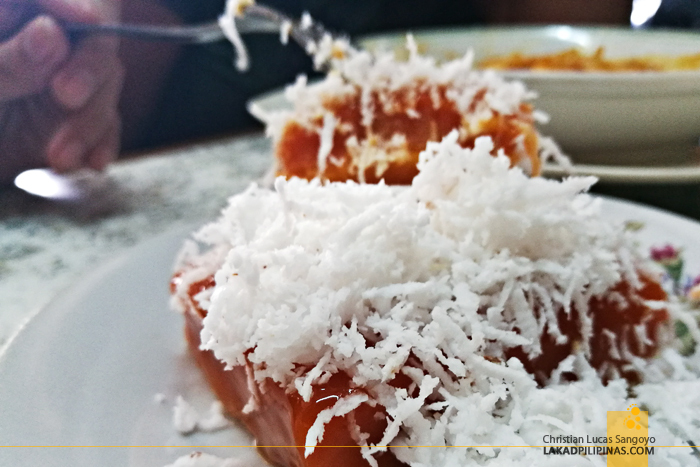 We capped our snack with two servings of their delectable kutsinta. 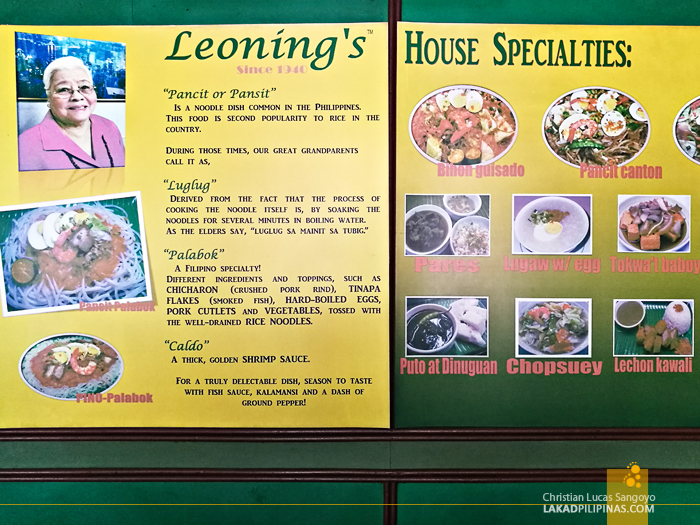 It was a very satisfactory first meal in Aling Leoning’s. The food might be a bit pricey, but it has that same legit taste I associate with the food my mom and dad always bring home every Sunday from the market. I can’t wait to come back and try their crispy binagoongan and see if it’s as good as those at Lola Idang’s.